Advocate staff photo by APRIL BUFFINGTON -- Monica Delahoz, right, assists Molly Dreznick, middle, and her sister Mandy Dreznick during rehearsal for the Kids' Orchestra's Honors Orchestra Spring Concert. 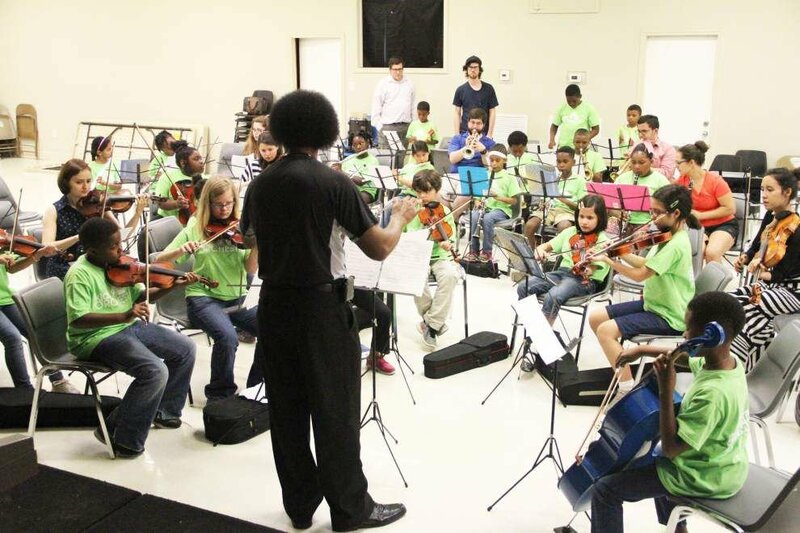 Advocate staff photo by APRIL BUFFINGTON -- Conductor Pat Lavergne leads a Kids' Orchestra rehearsal. Advocate staff photo by APRIL BUFFINGTON -- Unisdian Errandonia, left, and Tayelor Honore play the bass as the Kids' Orchestra rehearses at Christian Life Academy. Advocate staff photo by APRIL BUFFINGTON -- Conductor Pat Lavergne leads during a Kids' Orchestra rehearsal at Christian Life Academy on Sunday. Parker Shenefelt and Rickey Dille give a thumbs-up for the snacks. The two like playing clarinet in the Kids Orchestra, and they like joining fellow clarinet player Madison Morgan for Sunday lessons with instructor Sam Schreiber at Christian Life Academy. But snacks have a way of taking precedence when you know they’re waiting for you after rehearsal, especially when you’re 9, like Shenefeilt, or 11, like Dille. Both are students at Westdale Heights Academic Magnet School. Morgan is an 8-year-old home school student. And snacks aside, the students are preparing for their annual spring concert with the Kids’ Orchestra’s Honor Orchestra. The performance is set for 4 p.m. Saturday in the Christian Life Fellowship Sanctuary, only steps away from the middle school auditorium and classes, where they’ve practiced. The flutes, who practiced across the hall, were a little more serious than the clarinets. They talked about how they fell in love with the instrument the moment they heard it played. “I love its beauty,” Maniquwa Holmes, a Brownfields Elementary School student, says. Holmes was joined by fellow flutists, 9-year-old Asrielle Roberts and 10-year-old Gabrielle Clay, both Capitol Elementary School students; 11-year-old Sarah Bishop of Dufrocq Elementary School; and 9-year-old Eva Moran of Belfair Elementary School. All are members of the Kids’ Orchestra’s Red Orchestra, made up of the program’s most advanced musicians. Members of the Honors Orchestra range from fourth-year veterans who joined the program in its inaugural year, 2011, to students who started playing instruments last September. The Kids Choir will join them. 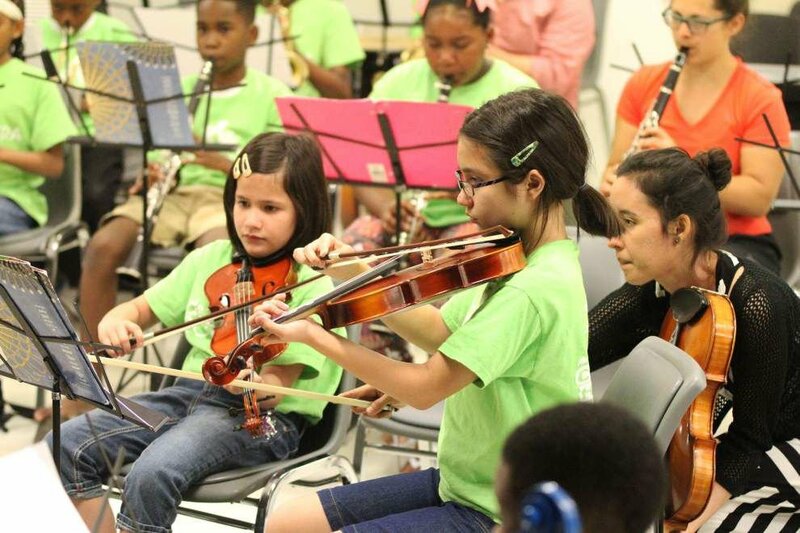 The Kids’ Orchestra has a staff of 75 professional instructors who teach students how to play specific instruments. Some are college students, like the clarinets’ teacher Schrieber, and others teach at high schools and colleges, like the flutes’ instructor, Suzanne Berkley, a professor at Southeastern Louisiana University in Hammond. The program meets at 12 schools each week during the school year with the Kids’ Orchestra providing transportation. The program raises money through donations, grants and help from foundations.